Much of the best comedy derives from personal pain, and comic turned filmmaker MikeBirbigliadeftly transposes his stand-up routine to the big screen. 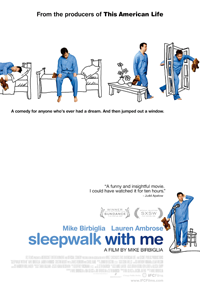 In its world premiere here at Sundance, Sleepwalk With Me charmed a morning packed-house, not an easy room to play. Credit to co-writers Birbiglia and Ira Glassfor the frothy distillation of one man's pain. Birbiglia and co-directorSeth Barrishkeep the comedy from tilting into pathos, while maintaining a steady hand on the complex relationship issues which inspire the mirth.